This oolong does not readily embrace the ‘Asian-style’ steeping that most of our oolong teas love. However, that shouldn’t stop you from preparing it that way if that is your normal steeping methodology for an oolong (or if you are simply curious or prefer it that way). This tea is another unique example of the special tea manufactures from the Jun Chiyabari Tea Garden, a small & exclusive tea estate located in the mid-eastern Himalaya hills of Nepal. 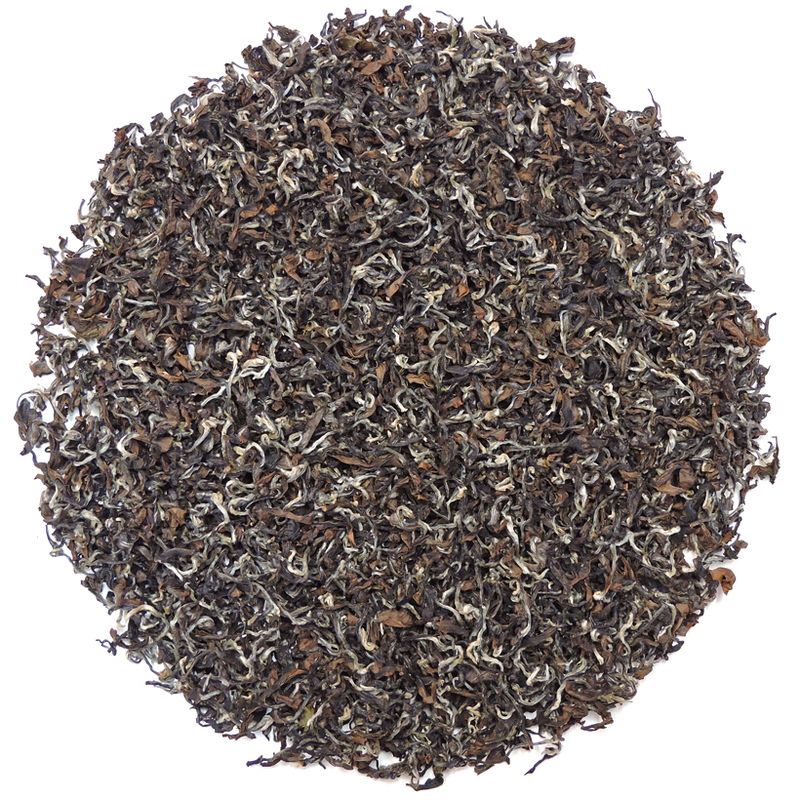 Nepal Moon Drops Oolong is a very special tea and we are delighted to be able to offer it to you. We work directly with Jun Chiyabari Tea Garden for the teas that we buy from them each year. Jun Chiyabari classifies this tea as an oolong, but they have used some new and innovative techniques in its manufacture. To be honest, this tea defies classification in a strict sense, but the result is absolutely delicious, and fans of the classical style of oolong manufacture will find the flavor to be at once familiar and similar, but also more flavorful and richer in the cup than expected. Part of the explanation for this tea’s soft but concentrated flavor is due to the leaf’s time of harvest. Being a ‘later’ harvest (late June, as is the case generally in Taiwan) the tea bears remarkable resemblance to the oolongs of Taiwan that are harvested and manufactured at this similar time. The fresh leaf for this tea was not withered (oolong tea is traditionally given an indoor or outdoor withering) and it was fired in hot firing pans (like green tea) but then taken off the heat and ‘smothered’ ( a step particular to yellow tea manufacture in China). The color of the leaf is a tad yellow-ish and the flavor soft and refreshing, reminiscent of a Taiwanese Bai Hao oolong. 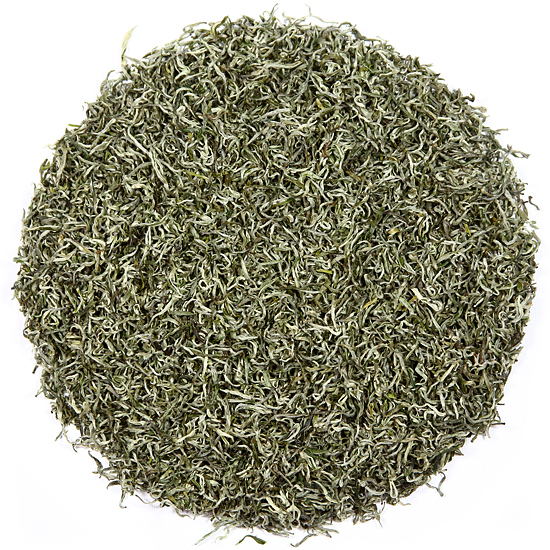 Fans of Chinese leafy white teas (such as Bai Mudan or Yue Guang Bai) may find that the flavor of ‘Moon Drops‘ is reminiscent to those white teas’ fruiti-ness and clean, soft style. However, the most helpful comparison for this tea is that it is really a Nepalese version of Taiwan’s Bai Hao, and you probably know how delicious that tea is! So this tea is a truly unique manufacture that is an absolute treat to have. The only bad news is that there is very little of it this year (the good news is that Tea Trekker purchased all of it!). Nepal Moon Drops Oolong is expensive, in the range with Taiwan Bai Hao oolong. Is it worth it? YES, especially given that this type of oolong is re-steeped numerous times, so that on a per-cup basis, the cost is similar to (or less than) a cup of ‘ordinary’ tea. Tea Trekker customers may have picked up on the fact that we do not tend to be fans of teas that are made in a different country (or similar growing region) from that of a tea’s historic place of origin. We are pretty traditional in our selections and shy away from much of the ‘innovative’ tea that is being made in different parts of the tea world today. However, we trust the work ethic and traditions that are in place at Jun Chiyabari and this tea is really a delicious new-style, ‘interpretative’ tea borrowing from several processing styles. We decided to agree with the tea makers at the garden and call this tea an oolong, because to us that seems to be the closest choice in order to describe it within the standard possibilities. This tea is soft in style and has large leaves that unfurl graciously in the teapot. The cool, clean air of this tea’s origin tea garden and pristine macro environment shows in its crisp and bright flavor in the cup. The gardens at Jun Chiyabari that produce leaf for this oolong tea are located at 6,000 feet in the ‘hills’ around Hile, a typical Himalaya hill-town, about 15 km west of Ilam (the major tea-producing region of eastern Nepal) not far from Sikkim and Darjeeling to the east, and Sagarmatha (Mt Everest) to the north. We think that the character of this high elevation tea flavor epitomizes the terroir of eastern ‘Nepal’ – which is exactly the effect that Jun Chiyabari is looking for.